I work in concert with garden designers and home owners to find a poetic blend of mass and strength, working with the scale of the garden and the house to find a balance and symmetry. I draw on a life long passion from walking in the mountains, observing how nature slowly revels the mountain cliffs, ledges, streams and waterfalls. I work in a broad range, from rustic to formal, from new construction to renovation, from small to large, from simple functional and conventional to the eye catching exotic. I came here from Arkansas in 1974 to work in the forestry coops, planting trees for 3 years. I came back in 1979 with my horses to work in forestry again, horse logging, tree planting, fence building, progeny tree measurements and tree climbing for cones. In 1987 I worked in metal fabrication building custom bicycle trailers and custom bicycles. In 1993 I started my own construction company to build with stone again. As a child on my family farm in Arkansas, we built with stone making walls, stairs and patios. 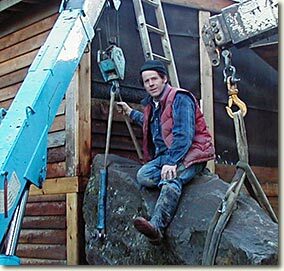 In 1998 I bought a crane truck to assist me in selecting, moving, and placing custom selected stone. With the crane truck I am able to travel to a wide selection of local quarries. This allows me to pick from a much wider selection of stones to find just the right shape, size, and texture. In 2001 I bought a small crawler crane which gives me the ability to reach much farther into a front yard and back yard to give a full service job option. LIC AND BONDED GENERAL CONTRACTOR CCB#110482.